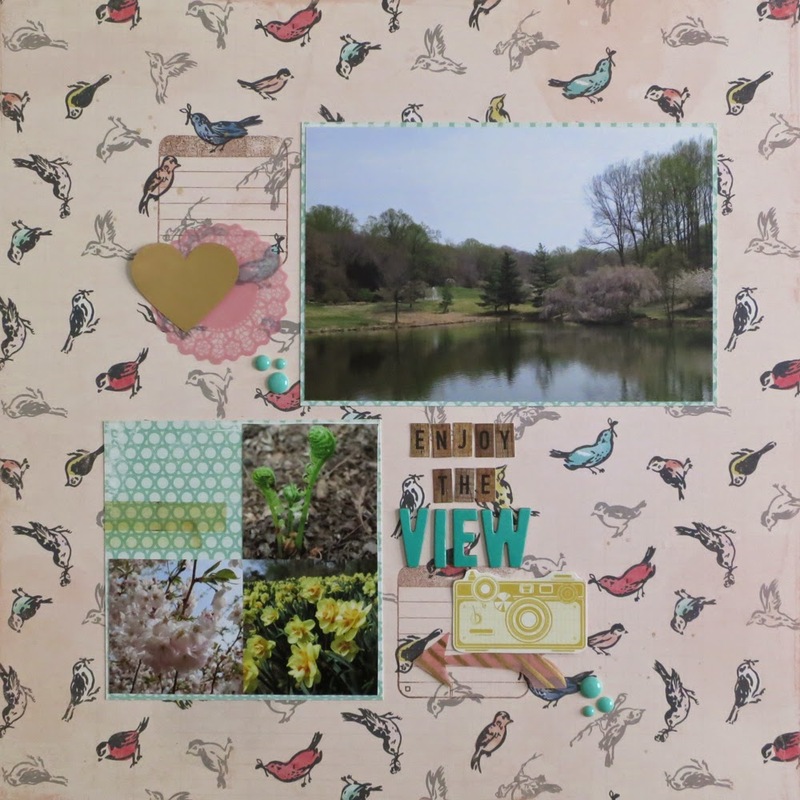 Last week I shared the first two layouts from a recent visit that the hubs and I made to a botanical garden and here are the other two. For these, I used sketches from the Sketchbook by Kelly Purkey class at Studio Calico. Not knowing anything about these classes, I can see why the response was so great when this new one was announced. Along with the twelve sketches she provides, there are interpretations by other creative folks and their projects each inspires a new sketch. So at the end, you wind up with 72 sketches and the examples not just for scrapbooking, but for cards and Project Life as well. I think paper crafting is the only time I will use the color red. Any other time I shy away from it, especially with clothes. 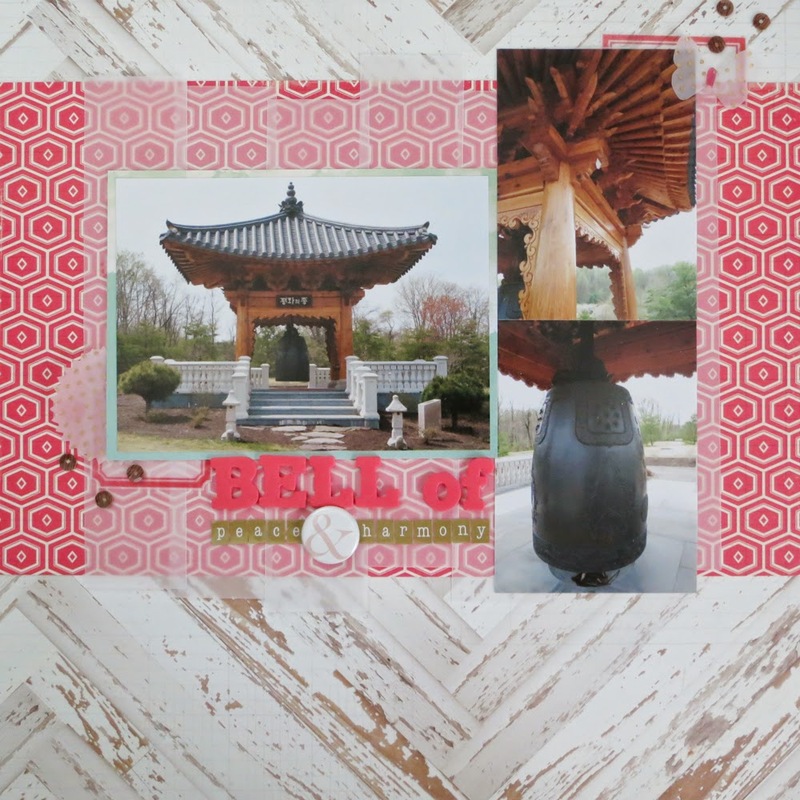 For this layout, I really liked how the red paper complemented my photos, but just to be certain it didn't distract, I used vellum for my strips and matted my primary photo. I'm am in no way a girly girl, but I really wound up loving this Maggie Holmes collection, and this little bird paper is a favorite. I struggled with embellishing the two areas and actually wound up changing it twice after I thought it was done. In the end I removed a couple of elements because it was causing the entire page to be a little chaotic. These turned out beautifully, Elise. Looks like such a lovely, serene place to visit. what great pages! so peaceful and pretty! I took Kelly's sketchbook 2 and 3 classes and got a lot out of them, too! Nice pages! And a great way to use bird paper, I always struggle with how to use that myself. Two very stunning layouts. I always love all of your pages though! I love the red on your first page, it goes great with these photos. Did you colour in those little birdies? Another great page. The vellum strips on the first layout are so nice on the red...and I love how fun the background is on the second layout. I'm also having trouble focusing on work with the nice weather. It's been a long winter! These are wonderful pages. The vellum paired with the wood grain pp is beautiful along with the cherry red color. Your photos are oh so fabulous and that birdie pp is adorable. Love the vellum strips, absolutely great idea!